When Mike and Renay moved to San Diego, they found a house in the neighborhood that they wanted to live in and settled down. Next on their list of plans was to start volunteering. 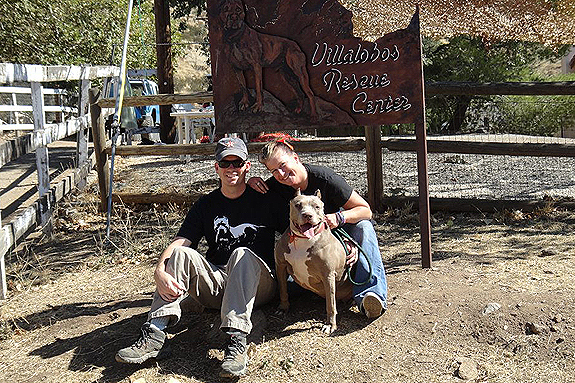 They visited a few rescues and decided that Villalobos Rescue Center was the place for them and, though it wasn’t exactly next door, they signed up and started making the three-hour trip up there every weekend to walk dogs. Still, she was older and had some medical issues. 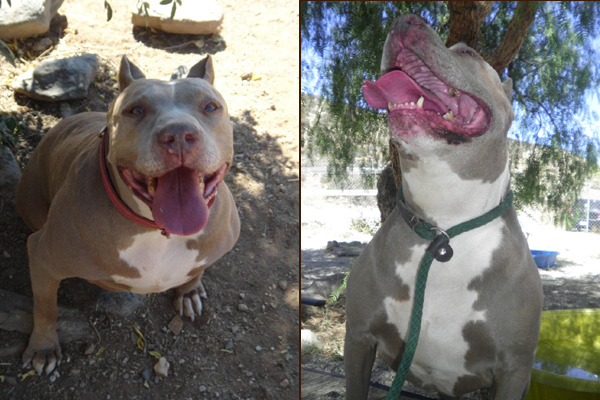 Besides, Mike and Renay were renting a house that did not allow pit bulls. And although they had discussed adopting a pit bull in the future, now was not the time, so Mike and Renay resolved to find Marilyn the perfect home, all the while knowing that it would be a bit more difficult to find a home for an older pit bull with about eight to10 lumps the size of golf balls. So Renay set up a Facebook page for Marilyn. Then Renay organized a fundraiser. Eventually, she raised the $1,400 that it would take to have all of those unsightly lumps removed. Fortunately, they all came back as benign, not cancerous. All of this strengthened the bond, but Renay and Mike still weren’t thinking adoption. Time went on. Mike and Renay continued to make the three-hour trip to visit Marilyn and the other dogs at Villalobos every weekend and whenever they got a chance during the week. They purchased a special diet for Marilyn to help her shed those extra pounds. And the bond strengthened for Marilyn as well. She went from “tap dancing” to vocalizing her excitement whenever she saw Mike and Renay approaching. Mike and Renay started to realize that it might be time to start discussing bringing Marilyn home. Of course, there was that landlord issue. But Mike and Renay are good tenants – certainly they could just approach the landlord and all would be OK? So they set up a meeting with him. They bought a nice bottle of wine. Renay made a slide show of Marilyn – Marilyn with kids, Marilyn with other dogs, Marilyn being cuddled. Seriously, how could anyone resist that? Well, apparently, someone could: their landlord. But wait! What if Mike and Renay offered to take out extra insurance on Marilyn? Still a no go. They even offered to take the landlord with them to volunteer. If he met Marilyn, he wouldn’t be able to resist, right? Who knows. He declined the offer to volunteer. So, Mike and Renay decided that maybe it was not meant to be, and they went back to trying to find Marilyn the perfect home – well, the other perfect home. Then, the news came. Villalobos was moving. They were setting up locations in New Mexico and Louisiana. New Mexico was not exactly next door, but was still a day’s drive. If they had to, they would just spend entire weekends there. But such was not the case. 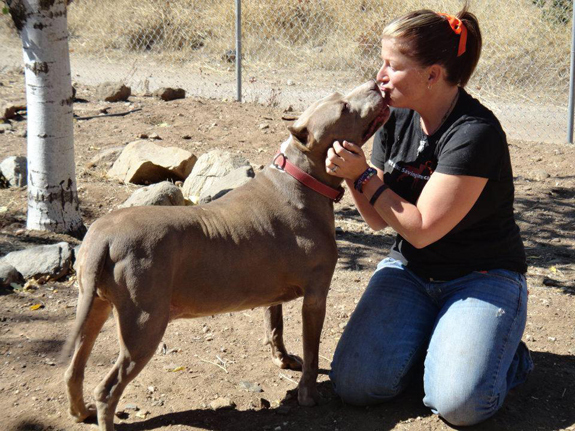 The New Mexico rescue still needed work, and Marilyn was scheduled to move to Louisiana. Unable to part with Marilyn, Mike and Renay went back to the landlord. Armed with another slide show as well as pit bull statistics, not to mention their own emotional words, Make and Renay had another meeting with him. They explained how their relationship had grown and how they knew that she was meant to be a part of their family. The answer: no. So, that was that. They had to move. The house two doors down was for sale. Mike and Renay weren’t looking to buy a house, so they went to the seller of the house and explained the situation. And, as luck would have it, the woman was into rescue! 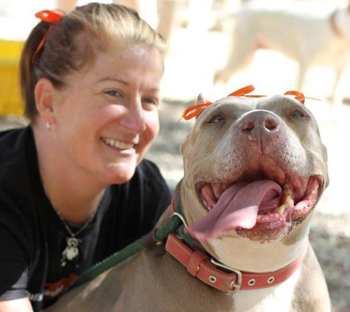 Not only that, but her daughter had two rescued pit bulls! On March 3, 2012, along with many friends, Marilyn aka “Mair-Mair” officially made the trip to San Diego to her new home with not only Mike and Renay, but also with her new brother Bizkit, an 8-year-old Chihuahua and new sister Abby, a 9-year-old white Boxer. Six months later, Mair-Mair Peters is a healthy 80 pounds and is a happy elderbull who loves life, plays fetch (something she never did before), and lying in the sun, (something she always did). Mike and Renay knew taking on another older dog might have some trying times but the transition has been a positive one. It didn’t happen overnight, but with a little work, love and patience the Peters family is just that, a family. YAY!!!! All of the stories this morning is making my day! Thanks for your time and dedication not only to Mair-Mari but to Villalobos and giving attention to the elder dogs, you guys ROCK! theprettychic Isn’t this just a lovely story. Stay tuned for part 2, where Renay and Mike tell us what happens after Mair Mair is home. 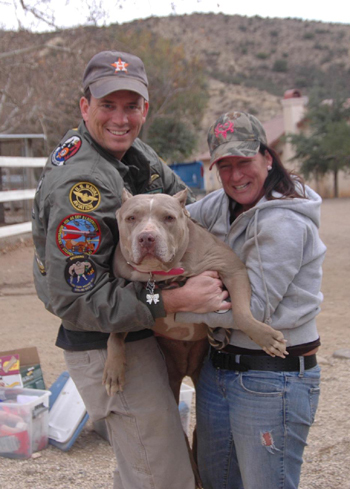 Mike and Renay, what a beautiful story of love, dedication, and tenacity…….you two sound just like pitbulls!! God has truly blessed you, Mair-Mair, and all of your other furry kids. Once again I’m wriring with teary eyes. Pibbles are so often passed by when people are looking to add a fur-kid to their family, especially elderbulls. You’re refusal to give up on her is inspiring. thank you. Okay, I’m sitting in a Starbuck’s, surrounded by people, bawling because this is such an amazing story! I’m so grateful to Mike and Renay – and people like them – who are willing to do whatever it takes to save these amazing creatures. You all rock, and you make the world a better place! MntlFlosser Thanks, like we said before, stay tuned when Renay tells us about life with Marilyn! Sniff….got me again. Mair-Mair is the quintessential pit bull in my eyes. She is gorgeous…and an elderbull? How could they resist? But what is so impressive is the doggedness (har har) with which they pursued her happy ending no matter if it wasn’t to be with them. But thank god it was. Bless you both, this was clearly meant to be! And I would love to see Mair-Mair tap dance (hint hint) but I did notice she had a great mane/pedi with red polish!!! DianaJones She is stylin’ now! double sniff…..i just love endings like this, she is ba..ba..ba..beautiful, mike an renay u r a god send, as 4 the landlord?? ?well…[email protected]#$%&^%$$……hi marilyn..aka mair-mair…u r so blessed lil sweetheart…. Perfect music for a perfect story. Glad you still live close enough to the old landlord to show him what a wonderful girl ol’ Mair-Mair is. Thanks for your tenacity. Smooches on your face, Marilyn. millermorgan Isn’t the video just wonderful? The video made me cry! Too sweet… I’m so happy for this sweet and silly dog, she looks like a gem! What a beautiful furbabie! and what a beautiful story. THANK YOU Mike and Renay for being such wonderful people.I have no doubt that Mearilyn is LOVED from the story and the Video., I only wish that thier were more good people on this earth like the two of you,(well, really 3 counting your new Landlord.) what a wonderful Lady! I wish you, Renay and Mearilyn the very best that life has to offer! mausbuilder Aren’t they just great, and yay to the landlord. We hope to have part 2 of this story very soon. StubbyDog mausbuilder Part two please! Landlord: You Rock!